This app I am using is called Parcel. 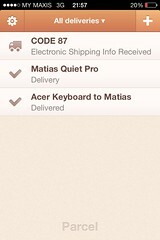 It tracks deliveries of parcels. The bottom two are interesting packages. Someone was interested in my old keyboard and wanted to take it off me in exchange for another mechanical product in his company store! I exchanged a 20 year old keyboard for a new one worth US$150! No brainer right? I have since received the other keyboard and love it! There was this particular keyboard that I have a heart for, it's called CODE Keyboard and it was sold out before it was launched due to the huge demand during pre-order. Reason being they are using a ultra-rare Cherry MX Clear switch. Yesterday, the website opened to say they had a couple of keyboards left from people who cancelled the order before it was shipped. Irrationally, my kiasu-ness got the better of me and I clicked on the Order button. I figure if I were to average out with the one I got for free, it is not so expensive. For that price and getting two keyboards, why not? It's an addict's justification. I am doomed and I need help!! !